with CD-ROM also contains four timed quizzes to challenge test-readiness, and includes four full-color anatomy charts covering: Anatomy & Physiology The Skeletal System The Circulatory System The Muscular System Unlike most flashcards that come loose in a box, our flashcards are bound in an organized, compact book that makes studying a breeze. Students can write their answer on the front of the card, and then compare it to the answer on the back of the card. This concise question and answer format makes it easy to find the right answer, and we even give details explaining why the answer is correct. 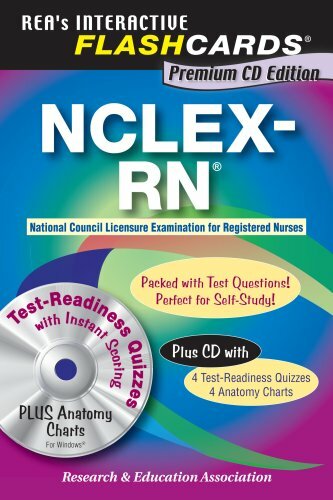 Fully indexed for smarter study, this book is an indispensable asset for anyone preparing for the NCLEX-RN exam!